Email marketing is one of the most effective online marketing strategies businesses optimize nowadays. 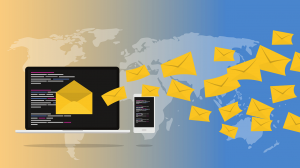 From reaching out to potential customers and nurturing existing clients and subscribers to promoting new products or services and boosting sales, email works wonders! In fact, statistics reveal that 55% of businesses generate over 10% of sales from sending emails alone. Make your customers feel special by sending them personalized emails. According to Experian, personalized emails generate six times higher transaction rates. You can achieve this if you segment your customers, craft an irresistible subject line, make your content informative and interesting, and use your recipient’s name. With tailored emails, you’ll have greater chances of increasing your click-through rates, sales, and revenue! With the number of social media users expected to reach 2.77 billion this year, imagine your potential to increase your customer base and sales by combining your email marketing plan with this powerful platform. Create email campaigns and share them on Facebook, Twitter, and other social networks! Your campaigns could become viral and you can gain the best sales results. Every single sign-up or purchase means a lot for your business. Thank your new subscribers by sending them a welcome email. It’s also best to deliver a transaction email to your customers after their purchase to show that you appreciate them. In your emails, you can mention a special offer or freebie that’s in store for them. This will make them feel that being on your email list and purchasing your product or service are good decisions. Your talented virtual assistant can help you in sending these emails and monitoring replies, so you can focus more on developing new strategies that can boost your sales. Your business won’t thrive without your loyal customers, so you better reward them. A simple token of gratitude goes a long way, especially in sales. Check your customer list, highlight your most frequent buyers, and use the power of email marketing to deliver incentives to them. An intuitive CRM software like Salesforce and Zoho can help you make this task easier and drive sales growth. Customers also respond well to discounts and timed special offers. Try to create a sense of urgency and get your prospective and existing customers to buy your product or take advantage of your promos through email marketing. Perhaps you can launch and deliver emails about a limited time special offer ahead of customers’ birthdays or anniversaries. It’s also a great idea to send out timed discounts during holidays. A website is one of the best tools for promoting your brand and increasing your sales. With an attractive and professional website, you can optimize your email marketing strategy. Make a sign-up box an essential part of your website. This way, you’ll be able to grow your email list, and potentially, your sales, as well. One of the good things about email marketing is that you can make several versions of your email and choose which one works best. With the help of services like Mailchimp and Aweber, you can create, split/test, and automate your emails. Why not try this method for your Valentine’s Day campaign? Send out different versions of a Valentine’s promotional email or newsletter to your beloved clients and use the version that will give you the best conversion results. Promoting your business and selling your products or services can be inexpensive and less complicated through email marketing. Take advantage of the tips and strategies we mentioned to attract and retain customers, boost your sales, and gain a better return on investment. Our virtual assistants can help you increase your sales through email marketing. Contact us to find out how we can work together!